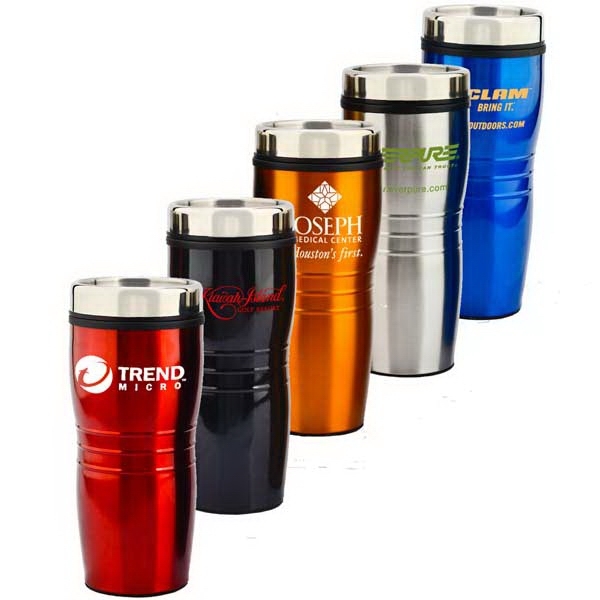 Description Everyone will drink up your next marketing campaign with this customized 16 oz. Wavy Travel Tumbler! Itis contoured with a ribbed grip and features a spill resistant double wall construction with a thumb-slide closure. The outer shell is made of stainless steel and the inner liner is plastic. This commuter mug offers a custom silkscreened imprintarea of 2 1/2" x 1 1/2" and is available in silver, blue, red, black, and orange. 24 hours rush production available, please call for more details. Imprint Size 2.5" x 1.5"